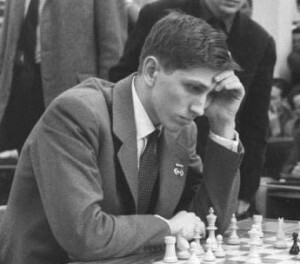 Born in Chicago, Fischer dropped out of high school at 16 to devote himself to chess. In 1958, he became the youngest grandmaster in history, but rose to international celebrity even beyond the world of chess when he became the first native-born American to win the title of world champion, defeating Soviet grandmaster Boris Spassky. After he refused in 1975 to defend his title against another Soviet challenger, Anatoly Karpov, he was stripped of his championship and withdrew into obscurity for two decades, reemerging to defeat Spassky in a private rematch in 1992.